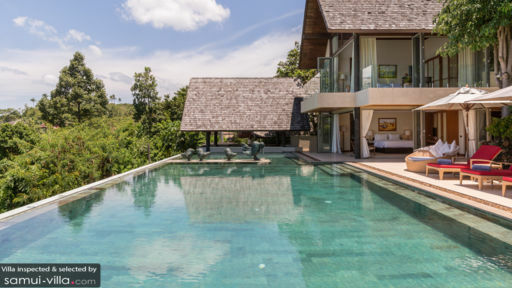 Just when you thought you’ve seen and experienced it all, a new standard of luxury suddenly rises amidst the jungle and rainforest high above the coast of Bophut in Koh Samui. Avasara Residence – one of five premium residences in the Panacea Private Villa Estate – exceeds all your expectations. Every inch and every corner was carefully designed, furnished and styled to organically integrate all 360 degrees of the captivating natural environment. The intention – totally redefine sophistication as well as heighten comfort, relaxation and enjoyment. If there is such a thing as a seven-star rating, Avasara Residence truly exemplifies that distinction. The villa has a total of five bedrooms – two of these are master bedrooms. One is situated on the ground floor and has direct access to the pool area. The other is on the top floor which opens out to a veranda. If you’re lucky enough to stay in a master bedroom, you get up from bed – every day – greeted by spectacular panoramic views. The three other bedrooms are on the ground floor and have direct access to the pool area. All bedrooms have dedicated bathrooms. Avasara Residence’s 20 meter-wide infinity pool is much like a veranda where you can just float on your back and try reaching for the clouds. Or, leisurely wade as you look out to the Gulf Of Samui or to the verdant mountain ranges in the distance. On the fringes of the pool is a swim-up bar for your convenience as well as cushioned pool beds and parasols that provide a bit of shade. 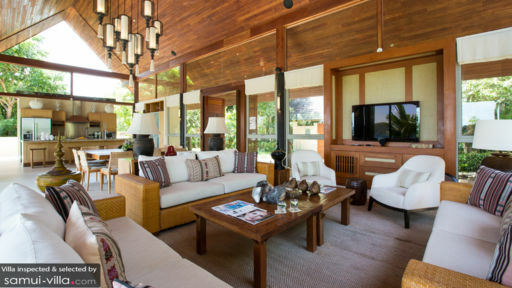 On the second floor of the villa is the spacious living area delineated by three cushioned couches and two easy chairs. Just a few steps away is the dining area with a set up for ten. And behind the dining table is a fully-equipped ultra-modern Kitchen. Out on the pool area next to the swim-up bar is the outdoor sala for alfresco dining or, perhaps, even partying. Although the dining table can only seat ten, extra seating is provided all around. For the duration of your vacation, the estate employs a staff quick in anticipating your every need. There’s also a kitchen team that can whip up authentic Thai cuisine fit for royalty as well as western gourmet specialties. Using fresh local produce and healthy ingredients, the team can also create individual menus according to personal dietary considerations or full-course feasts for really special occasions. 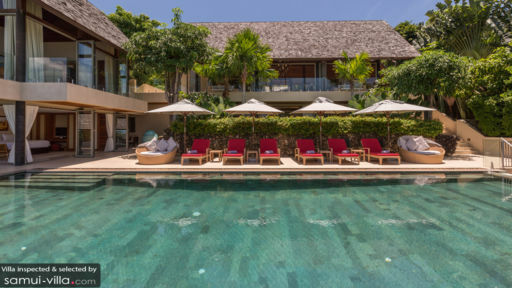 Although there seems to be so many things you can enjoy within the confines of the villa, you shouldn’t miss out on both the exhilarating activities around Koh Samui like hiking, biking, zip lining, fishing and all kinds of water sports. Nearby attractions you must also see are Paradise Farm, Coco Splash Waterpark, Elephant Trekking and the Butterfly Garden.